While viscous fluids like heavy fuel oils, low API grades of crude oil, or bitumen are inventoried at Storage terminals, maintaining the optimum process fluid temperature is critical to achieving trouble-free operation of the facility. If the fluids are allowed to cool, the viscosity of these mediums will increase, restricting the volume of product that can be exported from the tank due to the increased system resistance imposed by the downstream process piping. In turn, additional driver brake horsepower and extra inlet energy will be demanded by the Loading & Unloading pumps, due to additional viscous drag on the pumping rotor(s) and increased inlet losses within the suction area of the pump casing. To help mitigate temperature losses to the surrounding environment, the tanks, piping and loading/unloading equipment are well insulated. The process fluid is in turn continuously cycled from the storage tank by the Tank Heater Circulation system through an external heating package, typically a fired hot mineral oil design, with the heated oil being returned back to the tank. This arrangement is well suited to Storage tanks, as it eliminates the safety and maintenance hazards associated with immersion heaters and promotes the heat transfer to the process fluid without the need for a mixer, which would be impractical on larger tanks. As field experience demonstrates, Tank Heater Circulation systems can be challenging as well. At start-up, the process fluid within the external piping circuit (feed and return) can become highly viscous. In contrast to the Storage tank, this portion of process piping holds a relatively small volume of fluid compared to the total surface area of the manifold, where heat loss can occur. At start-up the full Tamk Heater Circulation system will be taxed. The pumps may be starved from an NPSH / NPIP standpoint and may cavitate. More driver shaft power will be required to push this viscous slug back to the tank, due to the increased accumulated pressure drops across the valves and the heat exchangers. 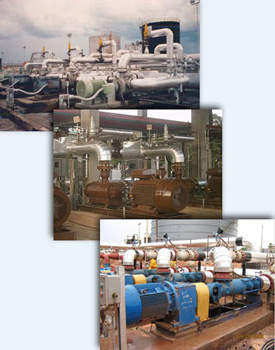 Heat tracing the pumps and controlling their operation with adjustable speed drives are effective means of managing this temporary condition to help maintain equipment reliability, and will avoid unnecessarily over-sizing the pumps to deal with this short term requirement. Oil and asphalt terminal managers and operators around the globe have realized that volumetric, rotary PD pumps are something they can capitalize on in these services. Having one machine that can efficiently transport heavy, medium and lightweight products simplifies the number of pieces of fluid-handling equipment required at these facilities. Controlling the rotary PD pumps with an adjustable speed drive allows operations to be performed in a "timed" manner without the need for flow control valves, eliminating the need for the recirculation of surplus process fluid. This reliable system control method takes full advantage of the tremendous turndown flow range of rotary PD pumps and their inherent high suction lift capability, making them an ideal fluid-conveying solution for circulating process fluids from your Storage tanks through your heating systems.